“I think I’m getting sick.” Those are some of the most dreaded words for a CF wife to hear. There is a lot of physical, emotional, and financial stress behind those five words (physical, as in coordinating childcare, getting things done at home, rotating between home, hospital, and work, etc.). When Jody speaks those words I’m usually not surprised and often it’s something I’ve wondered about myself. It takes a conscious choice however, to move from denial of another infection to accepting the inevitable, and seeking treatment. This begins by making a dreaded phone call to Jody’s CF team, alerting them to his symptoms and our suspicion of another infection. Such was the case this week. We enjoyed the entire month of July free of infections and hospitalization, for which we are oh so thankful! Suspecting our infection-free period was coming to an end, Jody made that dreaded phone call this Tuesday and was seen in the CF clinic on Thursday. As a result of Jody’s complicated (antibiotic) allergies with anaphylactic reactions, we have been told in the past that he is no longer allowed to start IV antibiotics from home. Instead, his team feels he needs to be monitored closely, in a hospital setting, to ensure his safety when initiating these powerful drugs. Because of this, we left for our Hopkins appointment on Thursday with our bags packed, prepared to stay, but hoping to return home. And that’s just what we did! Surprisingly enough, Jody’s doctors decided to put him on the same antibiotic regimen they used in June (Zyvox, Zosyn, & Colistimethate), and felt he could begin them from home since they were well tolerated before. 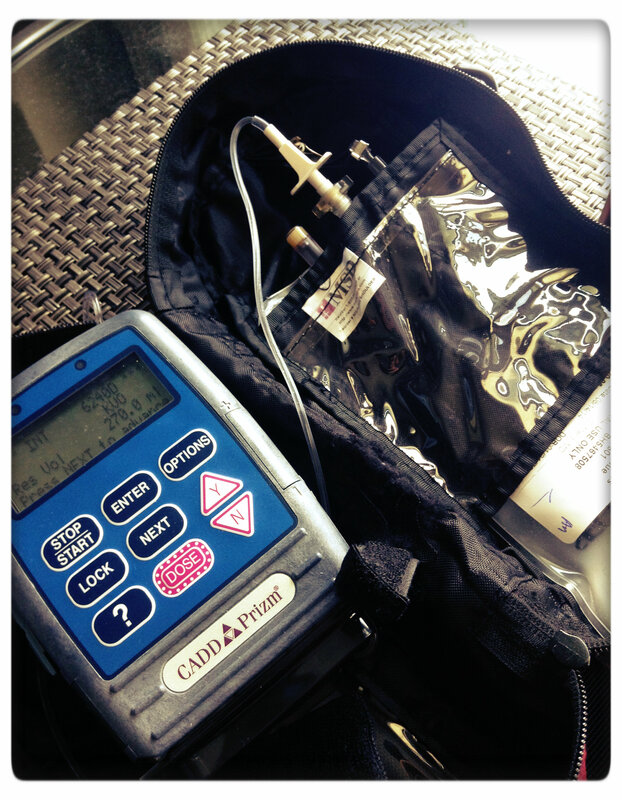 Jody’s “Luggage” (O2 tank and a continuous IV pump). Yesterday morning all of his supplies were delivered. I inserted and dressed the needle in his chest (he has an implanted port for medication administration), and with the Epi pen nearby, he began all of his antibiotics, thankfully without any difficulties or reactions. For the next two weeks (at least), Jody will have some extra “luggage” to carry around, as he puts it, referring to a continuous IV pump used for one of the three above drugs. The advantage to this pump is that he doesn’t need to wake up early and during the middle of the night to give himself his medications since it will do it automatically while he sleeps. We’re really glad Jody was able to avoid another hospitalization. I work 24 hours this weekend and it gives me much peace of mind to know that he will be at home, relaxing, instead of in the hospital where I would be missing out on his care and physician visits. Still I wish I could be home with him this weekend but such is the life of a CF wife. Completely off the subject, the wait for transplant continues. August 25th will mark five months of being active on the list. After getting the first call for his new lungs only a month after being listed (which turned into dry run 1 of 2) we naturally assumed transplant would happen sooner rather than later. Honestly, for a variety of reasons, we truly believed it would happen in June or July. Our oldest daughter turns six August 24th, and will begin kindergarten the next day (8/25), so we are now hoping that transplant will at least hold off for this, especially since she has a lot of anxiety about starting school. It’s hard to think that because transplant hasn’t happened yet we will miss out on a lot of her kindergarten experience when the time does come, and it also poses a lot more work for our parents, who do not live in our school district, and will need to transport her to and from school everyday. Our youngest also starts preschool in the beginning of September so she will need to be transported back and forth as well. This is one of the reasons we hoped transplant had happened already. 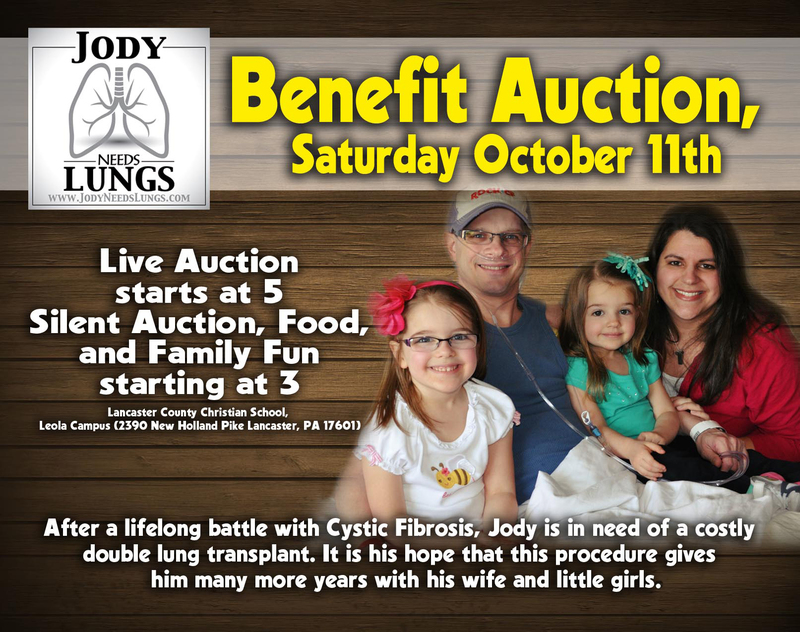 On the flip side, we understand that in order for Jody to get his new lungs it means the loss of another life, and that’s not something we want to rush, especially just to make our schedule more convenient. Schedule aside, Jody is ready for his transplant. 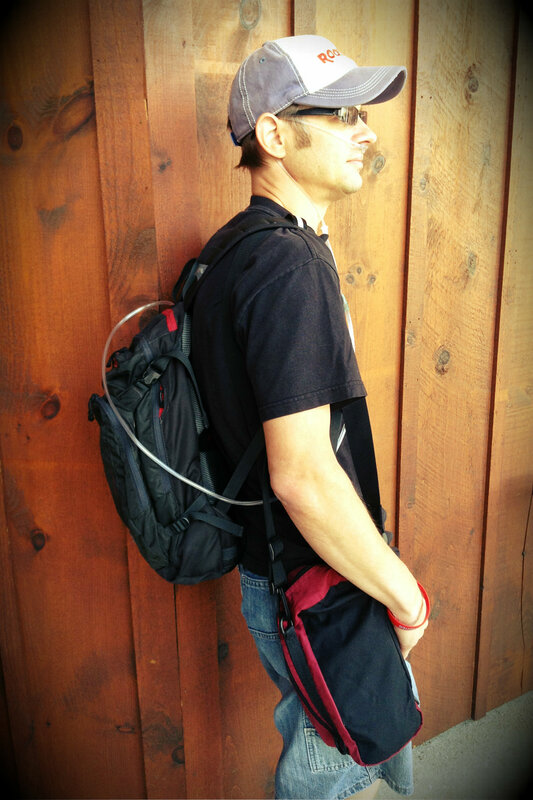 He’s tired of the hassles of Cystic Fibrosis, the struggle to breathe, the inability to do the things he enjoys, and of the need for continuous oxygen. While we may not understand it, we trust that God’s timing is better than ours, and hold firm to the belief that Jody will get his new lungs in God’s most perfect time. Until then, please continue to keep him, and our family in your prayers. Thanks so much for taking precious time to keep us updated, Tiff! Holding you all in my heart as prayers continue!